Email marketing has proven to be one of the most successful channels we’ve had in communicating (and converting) our own users. Anytime there’s useful content published or a new feature released, we let our audience know about it through email. But getting our email strategy to where it is today took a lot of work, and there are three big lessons we learned along the way. Having a clean list is so. Darn. Important. We wrote about this not too long ago: email hygiene is tough to acquire but with the right steps in place, you’re ensuring your emails are actually getting into your audience’s inbox. 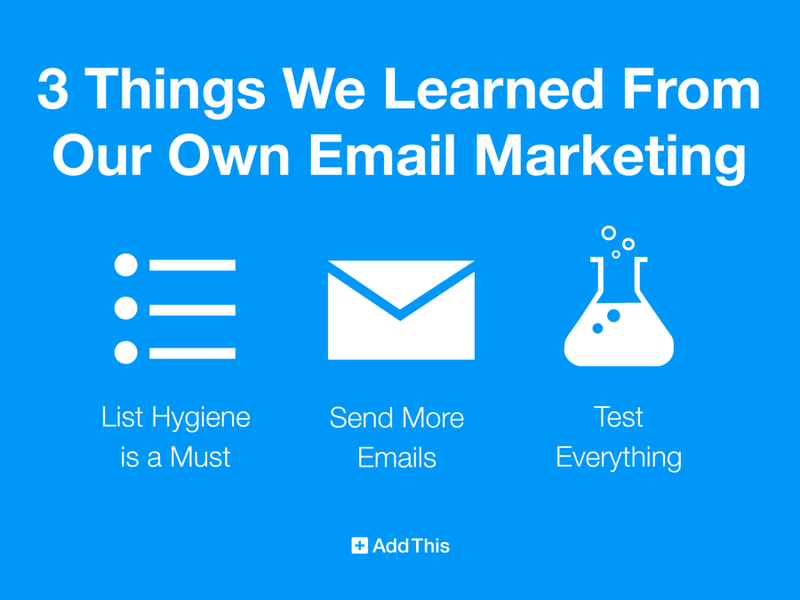 Any email marketing strategy can be doomed if your list isn’t kept clean. We had the practice of sending our newsletters just once a month, and little did I know that increasing frequency of emails actually helps your IP’s reputation. Whodathunk? As a first step, we implemented a marketing welcome series to all new subscribers to the newsletter. Our vendor, Listrak, has a module called the Conductor, which easily let us set up the logic and messaging for our welcome series. This was a great way to introduce ourselves to new users, keep engaging them during their first month with us, and keep the updated on our new tools and helpful resources. More recently, we started sending out weekly updates to our newsletter subscribers and it’s been quite successful. Not only is deliverability growing, but engagement is as well. We increased our open rate by 10% and our CTR by 8%. While we increased our communications, we were conscious to keep providing good content; content that’s relevant and timely to our audience. If you know us, you know we love testing and optimize based on our learnings. For almost every campaign, we test different subject lines and layouts to see what best resonates with our audience. It helps to have a platform that makes testing easy, so if you’re on the hunt for a vendor to use, keep this in mind. The best part of testing is that you’re not wasting your whole list on things that can fail. You can quickly learn and adjust, and send the winner to the remaining list&#8212lgetting more bang for your buck. Having the ability to look in-depth into our analytics, segment the data in all sorts of ways, and clearly getting a picture of the landscape that points to the right direction is essential to any email marketing strategy. This isn’t the end-all of a successful email marketing strategy, but just a few tips that got us going. Anything here surprise you?